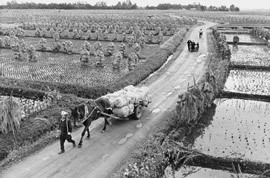 Horse carts loaded with harvested rice cross footpaths between the rice fields. Photo from 1955. Under Japan's 1946 land reform, landlords who owned more than the permitted amount had to sell the excess land to the government at a fixed price. The government then sold it at the same price, giving first preference to any tenant who had been farming the land. Japan’s land reform succeeded for two reasons. The first reason is that the Occupation had the power to impose and enforce a law that hurt the interests of a very powerful class of people, wealthy landlords, in order to bring about social and economic change. The second reason is more complex. At the time the land reform law was passed in October, 1946, it provided reasonable compensation to the landlords who had to sell their land to the government. But from 1946-48 Japan experienced rampant inflation, which reduced the value of the yen. As a result, while most of the buyers were able to pay off their loans within two or three years after they purchased the land, the money landlords received for their land was worth much less.